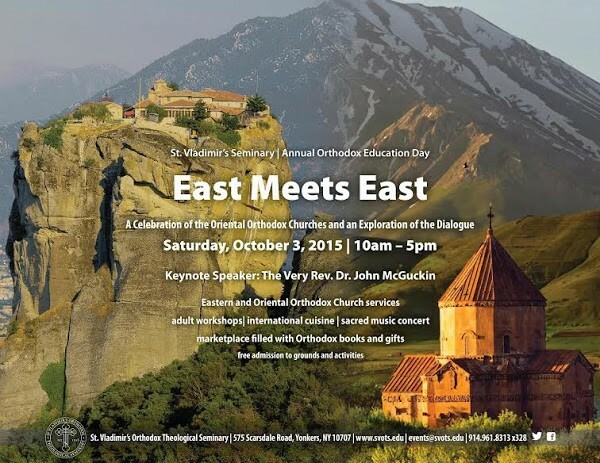 “East Meets East” is the theme for Saint Vladimir’s Orthodox Theological Seminary’s annual Orthodox Education Day on October 3, 2015. The seminary’s annual open house and fall festival will celebrate the relationship between the Oriental and Eastern Orthodox churches and explore the history of their dialogue. Renowned author and scholar Archpriest Dr. John Anthony McGuckin will give the keynote address, “Our Common Father: Saint Cyril.” Father John is the Ane Marie and Bent Emil Nielsen Professor in Late Antique and Byzantine Christian History at Union Theological Seminary and Professor of Byzantine Christian Studies at Columbia University. The day will be filled with Oriental and Eastern Orthodox church services; workshops on related topics, such as Coptic iconography; a liturgical music concert; and a marketplace filled with international cuisine and Orthodox books and gifts. Three Hierarchs Chapel and the seminary bookstore will be open to the public throughout the day. Admission to the grounds and events is free.